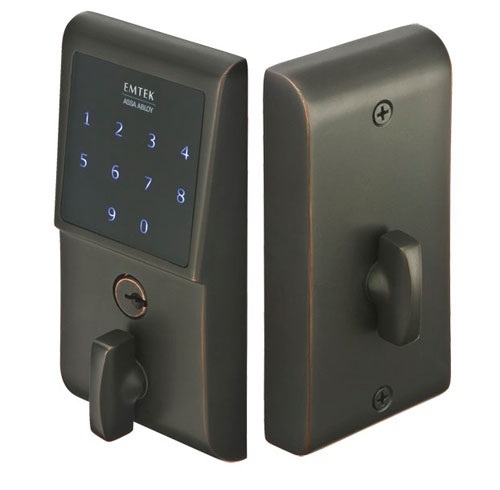 Residential keyless security has never looked better than Emtek's Low profile keypad deadbolt. Leave your keys behind with freedom and security that Emtek's keypad deadbolt provides. 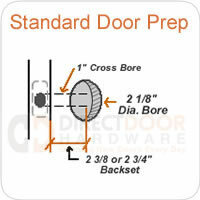 - Fits any door between 1 3/4" - 2 1/4" thick with a 2 1/8" bore standard prep. - Installs easily with only a phillips head screwdriver. - Easy to use installation and programming instructions provided. - Factory programmed with 2 unique, secure user codes for use right out of the box. - Can be programmed with up to 20 user codes of your choice. - Codes can be added or deleted. - Easy lock operation, simply push the Emtek button and turn the exterior thumb turn to lock. - Easy unlock operation, enter the 4 digit code and turn the exterior thumb turn. - Programming changes can be easily made using the keypad. - Keypad has a protective coating to prevent wear patterns. - Illuminated keypad for easy and quick operation after dark. - Low battery indicator lets you know when it's time to change the battery. 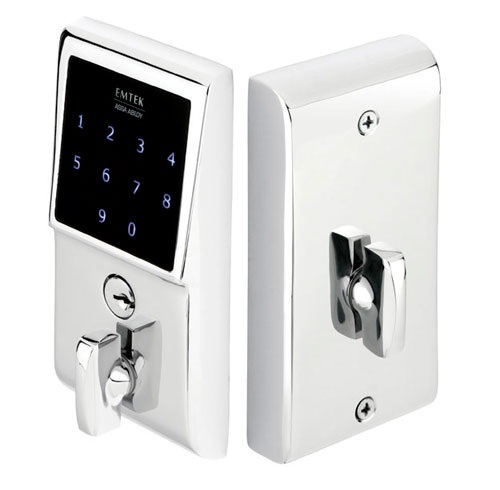 Emtek Electronic Locks have a 2 Year Warranty. For more information see Emtek Door Hardware Warranty. I purchased two of these, one year apart. The screens on both have become unreadable from wear the pattern where the code has been tapped in. Emtek said that could not happen with normal use unless chemicals were used on it or they were situated in direct sun in a hot climate. I live in Canada (not hot) and have never used a chemical to clean them. Emtek says the screens cannot be replaced, so both of them are expensive garbage. lock is OK. Looks great and easy to install. First one wasn't programed correct and pre-programed codes didn't work. Customer service second day aired male another. It got lost in a UPS warehouse. Company immediately second day aired me another. Second one was found and I ended up with two that worked. they sent me forms to send each back and I gladly cinplied.Looks good, easy to install and customer is second to no one. First off, Direct Door Hardware is a fantastic company to deal with. Their customer service is 2nd to none! I called in and spoke to their friendly and super knowledgeable staff a few times with questions about this hardware. Jake and Josh seriously know their hardware! It blows my mind how much these guys know. They have door hardware knowledge flowing through their veins like sweet nectar from the door hardware gods. I'll bet they eat Door knobs for breakfast! On a scale from 1 to MERICA I would say this company is right at the MERICA status. Shipping was fast. I love this electronic deadbolt. It is simple to install and it works excellent. Who knew life could be so great with new hardware? I really feel like things are looking up for me now. Thanks DDH! After trying in store off the shelf deadbolts with no success, I realized my door at 2 1/8" thick was not going to be accommodated by them. So online I went and found Emtek. Ordering was a matter of a few measurements and a color choice. It takes a little longer for shipping than one might think it should but it now seems worth it for a quality well designed apparatus. Install was a snap and operation is flawless, it's exactly what I wanted.